Jean-Luc Godard in 1988 at a press conference in Cannes after the first screening of the first two episodes of his very personal documentary, Histoire(s) du Cinema. [W]hat I am claiming here is not that television is entertaining but that it has made entertainment itself the natural format for the representation of all experience. Our television set keeps us in constant communion with the world, but it does so with a face whose smiling countenance is unalterable. The problem is not that television presents us with entertaining subject matter but that all subject matter is presented as entertaining, which is another issue altogether. >Whenever I need a dose of wisdom I always turn first to the profound thoughts of pop stars. And what better source of pop star wisdom than Björk. >I am on a journey of discovery, and I feel like what I’m discovering is not new, but the footprints of those who went before me. That’s how I feel about my woeful and wonderful ad hoc wanderings though folk music. But I am not worried, I keep finding amazing gems everywhere. Below are some clips of Rainbow Quest with Richard and Mimi Fariña originally broadcast Saturday, February 26, 1966. Tragically, on April 30, 1966, a mere two months after this show aired, Richard would be dead from a motorcycle accident. His death occurred only minutes after leaving his wife’s 21st birthday party. Mimi was the sister of Joan Baez. I have to say that for all the improvements in technology since Rainbow Quest was on the air I can’t think of a better way to present great folk music. Sitting around a kitchen table, drinking coffee, and jamming with Pete Seeger is just the best. >This amazing little video shows how consistently “on message” political candidates can be. 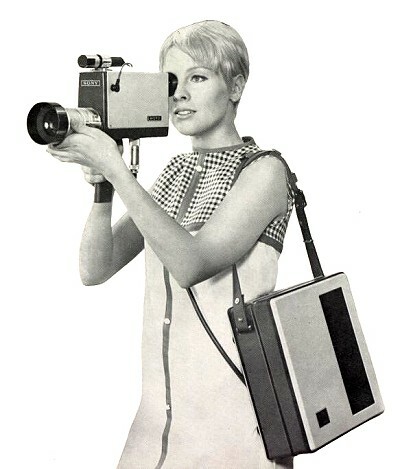 The portable video camera changed everything. In 1967 Sony introduced its DV-2400 Portapack (the Video Rover) and video production was placed in the hands of ordinary people, almost. It was still expensive, but universities could get the technology and students could take it out and start shooting. This camera system great contributed to the growth of video as an expressive and personal art form. Of course, many still used studio technology as well. By 1973 the form was established and growing, enough so that WGBH in Boston created a show on the topic (see clips below). Now our cell phones create digital videos that can instantly span the globe, or be posted online. But it all started somewhere. Maybe what is most fascinating about these kinds of technologies (and I include the Internet, mobile phones, etc.) is their democratic nature. Throughout the 1970s and 1980s there was a feeling that video, because it was so portable and instantaneous, could be at the vanguard of personal expression, the interchange of ideas, and forging new ways of seeing ourselves, and thus creating a better world. And it was, though a better world has proven to be elusive. In the 1990s those hopes shifted over towards the Internet, which has proved to be even more conducive to the spread of ideas. But our heritage includes a heavy (by today’s standards), black-and-white, reel-to-reel, portable video tape recorder and camera system invented in the 1960s by a Japanese corporation that would later give us the Walkman, Compact Disc, and DVD.